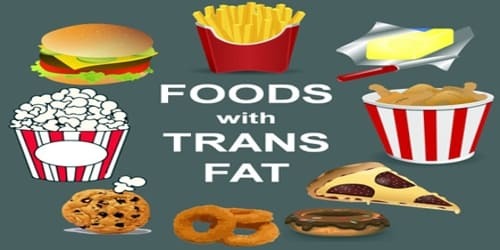 Definition: Trans fat, also called unsaturated fatty acids or trans fatty acids (TFA), are a type of fat found in small amounts in a wide variety of foods. Trans fat has been shown to be associated consistently, in an intake-dependent way, with an increased risk of coronary artery disease, a leading cause of death in Western nations. Trans fats are considered a ‘bad’ fat because, like saturated fats, they can increase levels of LDL-cholesterol in the blood. It can also decrease the level of ‘good’ HDL cholesterol and may increase the level of triglycerides, another type of fat in the blood. The primary dietary source for trans fats in processed food is “partially hydrogenated oils.” Look for them on the ingredient list on food packages. In November 2013, the U.S. Food and Drug Administration (FDA) made a preliminary determination that partially hydrogenated oils are no longer Generally Recognized as Safe (GRAS) in human food. 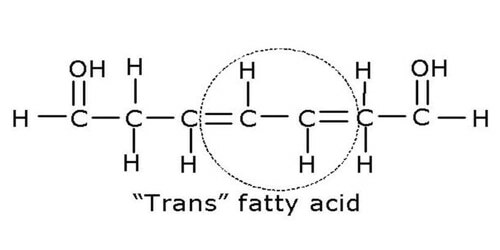 Trans fats also occur naturally, e.g., vaccenic acid and some isomers of conjugated linoleic acid (CLA). These trans fats occur naturally in meat and dairy products from ruminants. Butter, for example, contains about 3% trans fat. The World Health Organization recommended that trans fats make up no more than 1% of a person’s diet in 2003 and, in 2018, introduced a 6-step guide to eliminate industrially-produced trans-fatty acids from the global food supply. 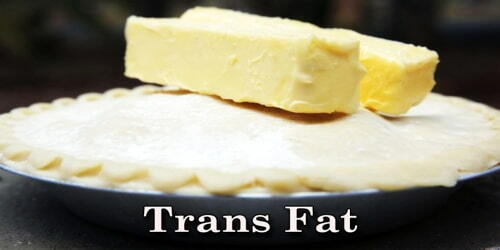 Trans fats are easy to use, inexpensive to produce and last a long time. Trans fats give foods a desirable taste and texture. Many restaurants and fast-food outlets use trans fats to deep-fry foods because oils with trans fats can be used many times in commercial fryers. Several countries (e.g., Denmark, Switzerland, and Canada) and jurisdictions (California, New York City, Baltimore, and Montgomery County, MD) have reduced or restricted the use of trans fats in food service establishments. Baked goods. Most cakes, cookies, pie crusts and crackers contain shortening, which is usually made from partially hydrogenated vegetable oil. The ready-made frosting is another source of trans fat. Fried food. Foods that require deep frying — french fries, doughnuts, and fried chicken — can contain trans fat from the oil used in the cooking process. Creamer and margarine. Nondairy coffee creamer and stick margarine also may contain partially hydrogenated vegetable oils. The majority of food manufacturers for vegetable oil-based soft spreads and margarines have low amounts of trans fats, which helps those of us who eat them stay well within the dietary guidelines. Health risk of Trans fat: Trans fats raise our bad (LDL) cholesterol levels and lower our good (HDL) cholesterol levels. Eating trans fats increases our risk of developing heart disease and stroke. It’s also associated with a higher risk of developing type 2 diabetes. The primary health risk identified for trans fat consumption is an elevated risk of coronary artery disease (CHD). A comprehensive review of studies of trans fats published in 2006 in the New England Journal of Medicine reports a strong and reliable connection between trans fat consumption and CHD, concluding that “On a per-calorie basis, trans fats appear to increase the risk of CHD more than any other macronutrient, conferring a substantially increased risk at low levels of consumption (1 to 3% of total energy intake)”. Low-density lipoprotein (LDL). LDL, or “bad,” cholesterol can build up in the walls of our arteries, making them hard and narrow. High-density lipoprotein (HDL). HDL, or “good,” cholesterol picks up excess cholesterol and takes it back to our liver. If the fatty deposits within our arteries tear or rupture, a blood clot may form and block blood flow to a part of our heart, causing a heart attack, or to a part of our brain, causing a stroke.